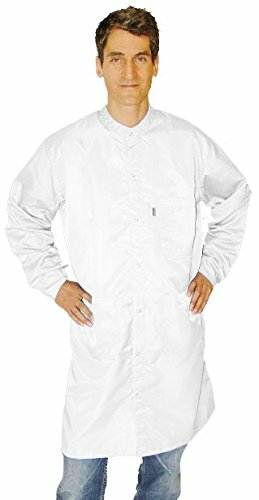 CleanPro C3.2, launderable cleanroom frock/smock. Concealed center front polyester zip closure. Mandarin collar. Raglan sleeves. Gripper stud adjustment at the neck. Unisex sizing. Anti-static knit cuff. Knee length. Full cleanroom garment construction. If you have any questions about this product by CLEANPRO, contact us by completing and submitting the form below. If you are looking for a specif part number, please include it with your message.